1.) elimination of the Medicaid expansion. 2.) elimination of the federal finical assistance for Marketplace coverage (i.e. cost-sharing reductions and premium tax credits). 3.) elimination of the individual and employer mandates. 1.) non-group market guaranteed issue. 2.) the prohibition on pre-existing conditions exclusions. 5.) essential health benefit requirements. To summarize, a partial repeal of the ACA would increase the number of uninsured people by 29.8 million in 2019, bringing the total uninsured to 58.7 million people or 21 percent of the non-elderly population compared to 28.9 million people if the ACA remains in effect. 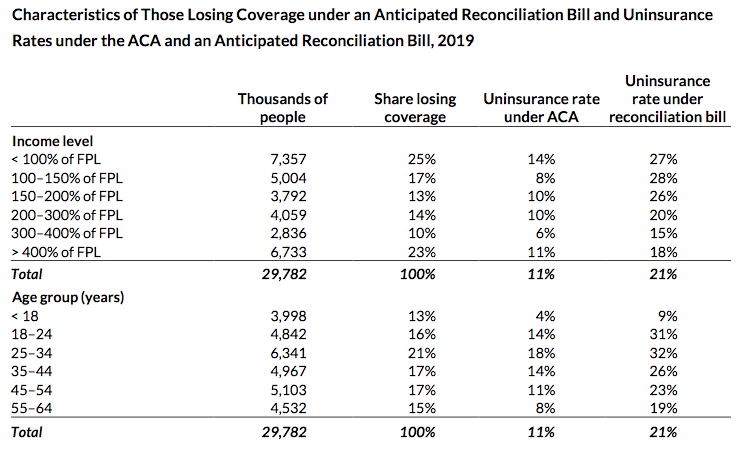 Even more notable, the number of uninsured non-elderly Americans would be significantly higher in 2019 than the 50 million who were uninsured in 2009 before the ACA was passed. 1.) the elimination of the individual mandate penalty would reduce the incentive to enrol for healthy Americans who can afford coverage. 2.) 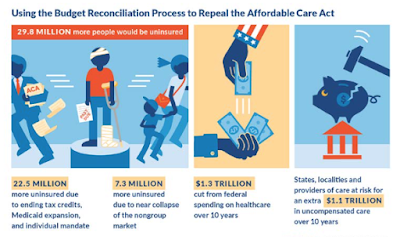 the elimination cost-sharing assistance and tax credits for insurance premiums would make coverage unaffordable for many people who are currently covered, resulting in an increase in dropped coverage. The study found that approximately 53 percent of those becoming uninsured would be people with family incomes ranging from 100 to 400 percent of the Federal Poverty Line (FPL); in addition, the study calculates that the uninsurance rate for American families with incomes ranging from 150 to 200 percent of the FPL will jump from 10 percent under the ACA to 26 percent under budgetary reconciliation. A total of 49 percent of adults ranging in age from 35 to 64 will join the ranks of the uninsured with 80 percent of uninsured adults lacking a college degree. 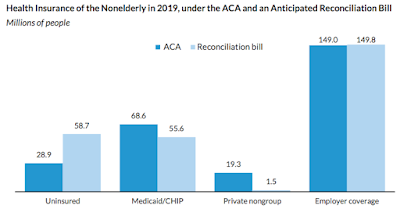 The impact on the Affordable Care Act of the 2017 budget reconciliation to be introduced in the Republican-controlled House and Senate could be very substantial, leaving tens of millions of Americans without health insurance; in fact, according to the analysis by the Urban Institute, the situation would be worse than it was prior to the introduction of the ACA. 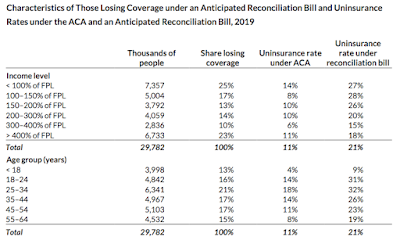 Since there would be a collapse of the non-group insurance market, the United States would find itself in a situation where there would be a higher number of uninsured American families than before the Affordable Care Act was enacted. This will make it increasingly financially difficult for American families, particularly those in the low- to middle-income range. The much higher cost of healthcare are taking their toll putting America in a huge bind. Evidence is rapidly mounting that Obamacare is moving towards failure. The long-term effects of Obamacare are slowly becoming apparent and by far the biggest problem is that it has driven healthcare costs through the roof. It appears the reason the campaigns were not more focused on healthcare is that it is a complex polarizing issue best left to be glossed over by flowery promises rather than hard facts. More on this subject in the article below.